ITU-T, which is a United Nations specialized agency, approved standards about soft errors*1 affecting telecommunication equipment on November 13, 2018. These standards stipulate the design, testing and quality estimation methods and reliability requirements concerning measures designed to mitigate malfunctions (soft errors) in telecommunication equipment on the ground chiefly caused by cosmic rays. To develop these standards, NTT, Fujitsu, Hitachi, NEC, and Oki jointly developed draft Recommendations at "the Ad Hoc Committee on Soft Error Testing (SOET_Adhoc)" formed by TTC, and have driven efforts at ITU-T SG5*2 meetings, with the cooperation of Orange, to have these drafts adopted by ITU-T. The adopted standards will help to establish networks that are more highly reliable based on the requirements governing measures against soft errors. In recent years, the number of soft errors caused by cosmic radiation neutrons has been increasing gradually even in telecommunication equipment located on the ground (Figure 1). The soft error disappears as soon as the semiconductor device concerned is restarted or the data concerned are overwritten. Even though a soft error in data can cause a malfunction or system outage, it is difficult to reproduce such a transient error and identify the cause. Since a soft error can have a serious impact on the user, it is a major headache for system operators. Telecommunication equipment is designed so that such malfunctions do not affect network services. However, because soft errors are difficult to reproduce, they were not sufficiently verified at the development stage. Recently, however, it has become possible to measure the influence of soft errors on telecommunication equipment using a compact accelerator-driven neutron source*3. This measurement makes it possible to determine the influence of soft errors and take preventive measures in advance before vendors sell products and telecommunication carriers introduce telecommunication equipment into operating networks. While it has become possible for carriers to improve network quality dramatically by mitigating soft errors at the stages of equipment development and introduction, there is a need for requirements that serve as the benchmark for methods and evaluation of countermeasure. Against this background, at the October 2015 meeting of ITU-T SG5, commencement of a study program on soft errors in telecommunication equipment was approved with the intention of defining requirements on measures against soft errors, ranging from design to evaluation and quality. The SOET_Adhoc member companies worked together and developed draft Recommendations. ITU-T has now approved these Recommendations. The Recommendations stipulate the design, testing and quality estimation methods and reliability requirements concerning soft errors. They include benchmarks based on which vendors and carriers can select measures against soft errors that are appropriate for the required reliability level. The soft-error-related standards approved by ITU-T consist of five Recommendations and a supplement. Figure 2 shows an overview of the Recommendations. (1) Impacts of soft errors caused by particle radiation. (2) Overview of design methods to mitigate the impacts of soft errors. (1) Methods of estimating the soft error failure rate depending on the devices used and equipment configuration. (2) Methods of determining the areas requiring soft error measures. (3) Specific soft error measure design methodologies, their effects, and notes on application of soft error measures. (1) Soft error measure examples for field programmable gate arrays (FPGAs). (1) Definitions of standards concerning the frequency of maintenance replacements and the frequency of main signal interruption, and the degree of certainty of non-occurrence of silent faults, due to soft errors. 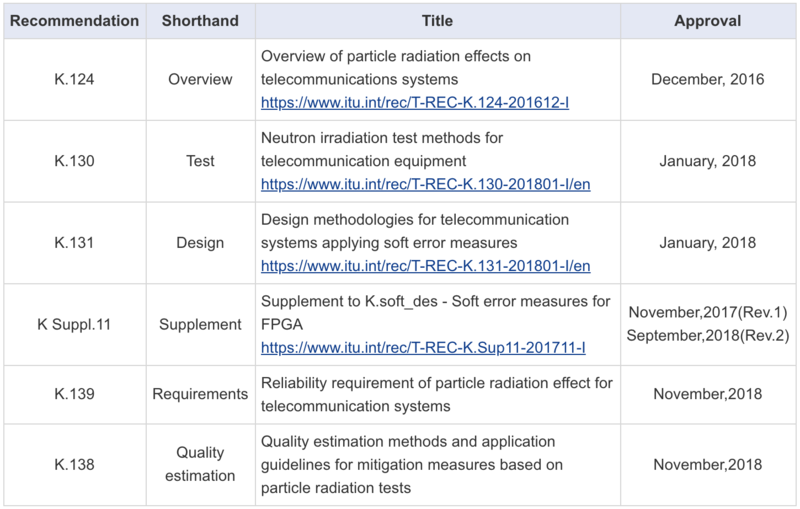 (1) Method of determining whether various reliability requirements for telecommunication equipment regarding software defined in K.139 (Requirements) are satisfied or not, based on the results of the neutron irradiation test described in K.130 (Test). It is expected that widespread deployment of telecommunication equipment that satisfies the requirements defined in these Recommendations will improve the reliability of telecommunication services. *1 Soft error Unlike a hard error, which is a fault that causes permanent malfunctioning of a semiconductor device, a soft error is a temporary error that disappears as soon as the semiconductor device concerned is restarted or the data concerned are overwritten. *2 ITU-T SG5 ITU-T(International Telecommunication Union – Telecommunication Standardization Sector) is an ITU organization that issues Recommendations with a view to standardizing telecommunications. Study Group 5 (SG5) investigates issues related to the environment and climate change. *3 Accelerator-driven neutron source A facility for producing neutrons through a nuclear reaction caused by irradiating the target with protons or electrons that are sped up by an accelerator. *4 Particle radiation effects Impact of particle radiation (emitted energy in the form of neutrons, alpha particles, etc.) on semiconductors. In recent years, the number of soft errors in semiconductors caused by neutrons generated in the atmosphere by cosmic rays has been increasing on the ground.